A passenger on a Caribbean cruise was arrested for allegedly selling drugs on board. (CNN) -- A cruise passenger's trip came to an abrupt end when authorities allegedly found narcotics and about $51,000 in cash in his cabin. Steven Krumholz, 51, was arrested last week for allegedly dealing drugs out of his cabin during a Caribbean cruise aboard Allure of the Seas. Authorities found nearly 3 grams of methamphetamine, more than 140 Ecstasy pills, ketamine, $51,020 in cash, and a $960 money order in Krumholz's cabin, according to U.S. Customs and Border Protection. The drugs and money were discovered during a random inspection of the ship's passengers Wednesday in St. Thomas, U.S. Virgin Islands. Another passenger found to be in possession of narcotics pointed authorities to Krumholz's cabin, where the drugs were allegedly purchased, CBP said in a statement. The ship, the newest and largest in the Royal Caribbean fleet, was chartered for the sailing by Atlantis Events for what it billed as the "world's largest gay cruise." 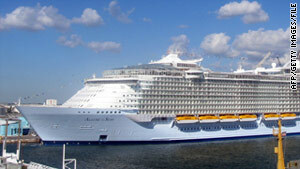 Royal Caribbean said it has a "strict zero tolerance policy" for illegal drugs on its ships. The cruise line is cooperating fully with authorities, the company said in a statement. Atlantis Events told cruise website Cruise Critic that passengers "are fully advised of all policies and customs laws in advance of sailing. Atlantis fully supports Royal Caribbean's policies and works closely to enforce them." Krumholz was turned over to Immigration and Customs Enforcement agents. The ship completed its itinerary and returned to Port Everglades, Florida, on Sunday.